Some 14 African presidents, a king, a queen, a prince and an emir are expected to attend Sunday's World Cup final between Spain and the Netherlands, FIFA [ ] said. The guest list includes Queen Sofia of Spain and outgoing Dutch Prime Minister Jan Peter Balkenende to lead support for the two finalists. A bigger question over the final will be whether Nelson Mandela [ ] will attend, after missing the June 11 opening ceremony because of the death of his 13-year-old great grand-daughter in a traffic accident the night before. FIFA president Sepp Blatter [ ] has said he hopes former South Africa [ ]n President Mandela, the much loved father of post-apartheid South Africa, would be able to attend. Mandela, is in frail health at the age 91, and his office rarely gives details of his movements in advance. He is widely credited with helping South Africa win the World Cup bid in 2004. 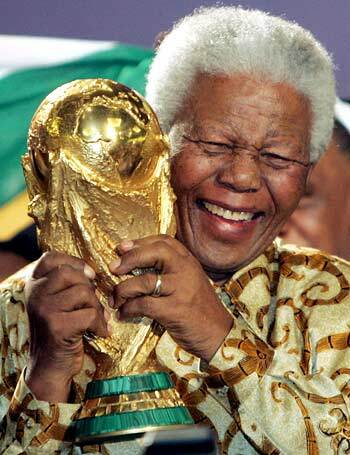 The presence of Mandela, known affectionately by his clan name Madiba, would cap what is seen as a huge success by South Africa in hosting the continent's first World Cup. Soccer's ruling body said the guest list included President John Atta Mills, of Ghana, the only one of six African countries in the finals to do well by equalling the continent's record of reaching the quarter-finals. It said the list could change but also included President Robert Mugabe [ ] of neighbouring Zimbabwe, Monaco's Prince Albert, Qatari Emir (ruler) Sheikh Hamad bin Khalifa al-Thani, Nobel peace prize laureate Desmond Tutu [ ] and Spain's Wimbledon [ ] champion Rafael Nadal [ ]. King Mswati of Swaziland, sub-Saharan Africa's last absolute monarch, is also due to attend. South African police have warned of heavy security and road closures on the main highway going to the Soccer City stadium during the afternoon before the closing ceremony for the match.